This sweet and savory chicken is so delicious and incredibly easy! Serve it over a bed of rice with juicy pineapple for a tropical twist... You'll feel like you've found paradise! Place chicken in slow cooker. 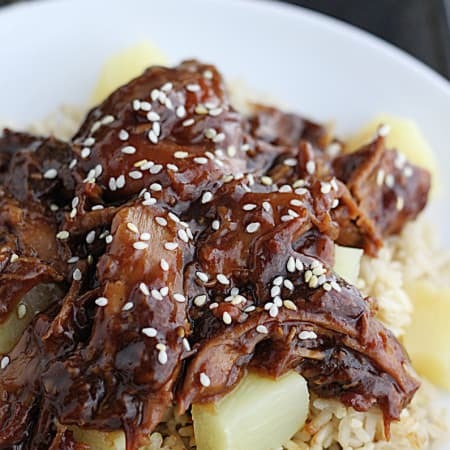 In a bowl combine soy sauce, honey, apple cider vinegar, and next five ingredients. Mix well, then pour over chicken. Cover and cook on low 4-6 hours. About 30 minutes before serving, drain liquid from slow cooker into a large sauce pan, add minced garlic, and cook over medium high heat about 3-4 minutes. White sauce is simmering, shred chicken in slow cooker with two forks. Whisk together cold water and corn starch until dissolved, then add to sauce pan. Cook, stirring constantly, until sauce thickens. Add sauce back to slow cooker and cover until ready to serve. Serve chicken over rice and pineapple. Top with sesame seeds.